Noah Brunelli of Wakefield (13 years old) with the 4.9 pound largemouth bass he caught on the Saugatucket River with worms he dug from the woods next to his home. Many of us may have a touch of cabin fever after being waylaid by the remains of Jose. Freshwater fishing is a good bet after a storm as the water is not as turbid and conditions are usually more tolerable with no high ocean surf. As the weather clears here are some ‘fishing after storms’ thoughts and tips. Be safe. Winds and rain create fast moving water on river banks and the coastal shoreline. Stay away from this water as you can get washed in particularly from high ocean surf. A storm like the one we had this week can change fishing a lot. Some species like summer flounder (fluke) may leave the area totally. Yet others species just won’t bite. They may not bite because the water is dirty with sand that irritates the gills of fish so they stop moving around and feeding or they simply cannot see your bait in murky, cloudy water. Storms can also create fishing opportunities with reefs, clam and mussel beds that get torn up with broken shells providing a feeding ground for many of the fish we target. Additionally, a good storm this time of year often provides a cleansing and transition time for anglers suggesting it is time to target fall species like tautog, migrating striped bass, surface feeding bluefish, cod and false albacore. The Narragansett Chapter of Trout Unlimited (TU225) will host its monthly membership meeting on Wednesday, September 27th, 2017, 6:30 p.m. at the Coventry/West Greenwich Elks Lodge, 42 Nooseneck Hill Road (Rte. 3, Exit 6 off of Rte. 95), West Greenwich, R.I.
After a short chapter meeting, Ron Lasko will give a presentation titled ‘Beyond a tale of two rivers – a future for sea run brook trout’. Lasko is the author of ‘A tale of two rivers’ which is the ecological, and historical story of Cape Cod’s sea run brook trout. For additional information contact Glenn Place at 1-401-225-7712 or at TU225President@gmail.com . Black sea bass, scup and summer flounder. Anglers are reminded that the black sea bass season in Rhode Island and Federal waters is closed this Friday, September 22 to October 21. The season opens again on October 22 with a seven fish/person/day limit. The closure in the fall was a tradeoff for the season staring a month earlier in June this year. “The scup bite is strong at Sabin Point and Colt State Park with anglers often reaching their 30 fish limit. They are also catching a lot of northern kingfish.” said John Littlefield of Archie’s Bait. This weekend anglers fishing my dock and the Town Dock in Wickford were landing scup, northern kingfish, skipjack bluefish and an occasional summer flounder. I fished off Beavertail Point this weekend with my brother Henry, Mike and friend Kevin. They landed summer flounder, black sea bass and scup with a slow pick of keepers. Freshwater fishing continues to be good in area lakes and ponds. 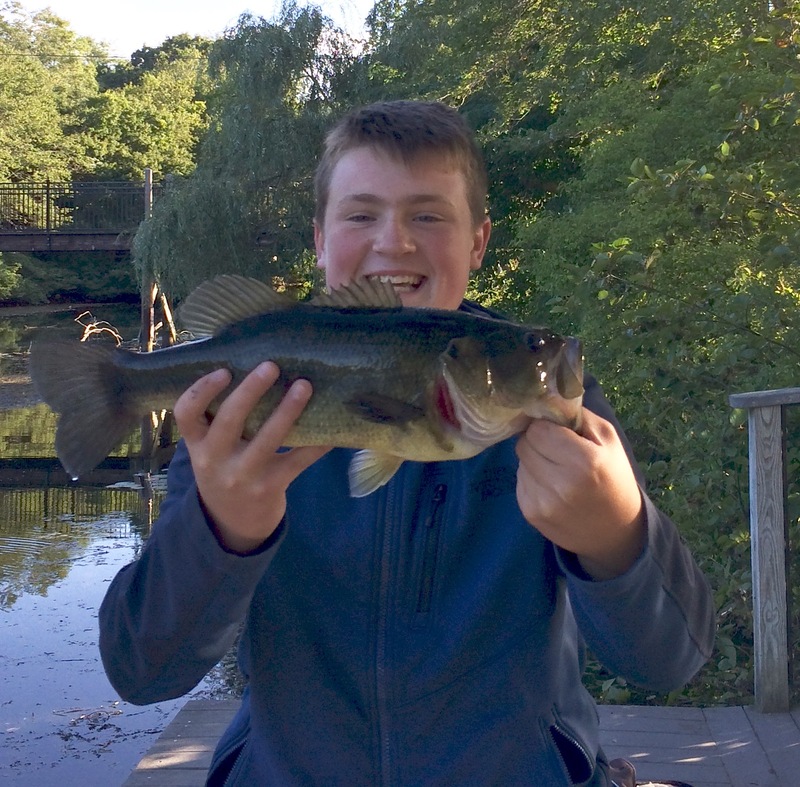 “The largemouth bass bite is good in ponds at Rehoboth, MA and at the Brickyard Pond in Barrington where one of my customers caught a six pound catfish this week.” said John Littlefield of Archie’s Bait & Tackle. “The largemouth bass bite is very solid with three and four pound fish being landed fairly common in places like Meshanticut Lake and Randall Pond in Cranston.” said Dimitri Mancini of Continental Bait. 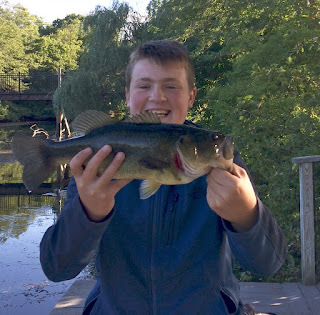 Noah Brunelli (13 years old) and his brother Zach Brunelli found a good largemouth bass bite to 4.9 pounds on the Saugatucket River. They caught multiple bass using worms dug from the woods near their home in Wakefield, RI.